Killerry, from Ir. Cill Oiridh [logainm.ie], is the name of a townland and a parish in the barony of Tirerrill. This peak is also known as Slish Mountain. Killerry Mountain is the 1169th highest place in Ireland. Killerry Mountain is the most easterly summit and also the second most northerly in the Ox Mountains area. Picture from swoop : Lough Gill and more !!! Picture: Lough Gill and more !!! Climbed 27th Jan 2011 with my buddy Zocolco. ( St.Angleas College- aka Eyesore) KBoy, Benbo and eve Dough in Leitrim. 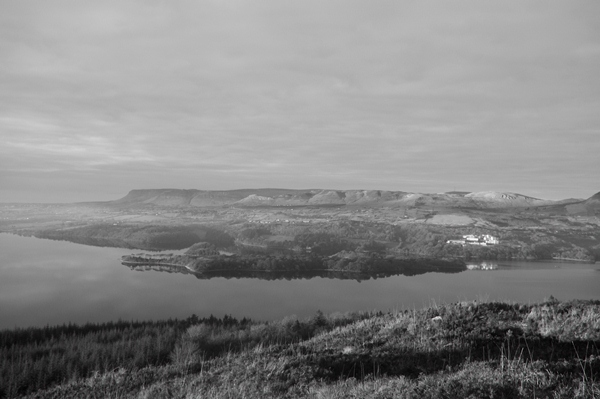 Looking west you see 90% of Lough Gill, Sligo Town Cathedral Spire , Knocknarea , even Ballyconnell head and Raghly in the distance.